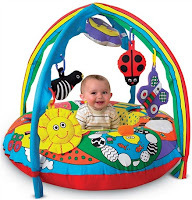 Galt Baby Playnest Gym only £19.99 - a safe, full of fun cocoon for baby, consisting of an inflatable ring to keep baby safe, secure and comfortable, and has an overhead toy gym with a selection of hanging toys, ideal for teaching hand and eye co-ordination. The playnest gym features bright pictures, colours and textures that will amuse and delight babies from birth. Diam. 99cm (39"). Height 79cm (31").